NEW concealed carry and open carry laws. NEW transportation laws. NEW reciprocity agreements. NEW restaurant carry and campus carry laws. HUNDREDS of changes from past editions. 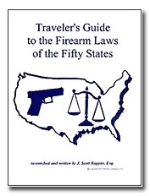 If you own or carry a gun, don't dare travel out of your state without The Traveler's Guide to the Firearm Laws of the Fifty States! Read the book before you travel. Pack it with your gun gear. Keep a copy in your vehicle. Use it as a reference so you'll know what to expect when you approach a state line.